I went down to the ocean's edge at low tide last week. I like to go there to think sometimes. Yes, I can think anywhere I happen to be but there's something special about the thinking I get done when I'm close to the ocean. I think the salt air helps. I've been thinking a lot about my mortality lately. You see, a friend of mine almost died the other day. All of a sudden he collapsed and stopped breathing. His girlfriend was sitting there with him when it happened. She was calling 911 when he stopped breathing. When he gained consciousness again she called my partner and he raced over there. The hospital couldn't find anything wrong with him. Scary stuff. Living in a small town, you're more likely to hear about it when someone dies. Many of my friends and acquaintances have died the past few years especially. You remind yourself that every day is precious and if you have a bucket list, you better start chipping away at it. Now. Today. But you know what seems to happen? You just continue on with your same old routines. Maybe you make small changes, but unless you're very uncomfortable or threatened, it's usually the same old, same old. Anyway, like I said, I went down to the water's edge to get my think on. I hadn't been there but a moment when I saw a movement out of the corner of my eye. 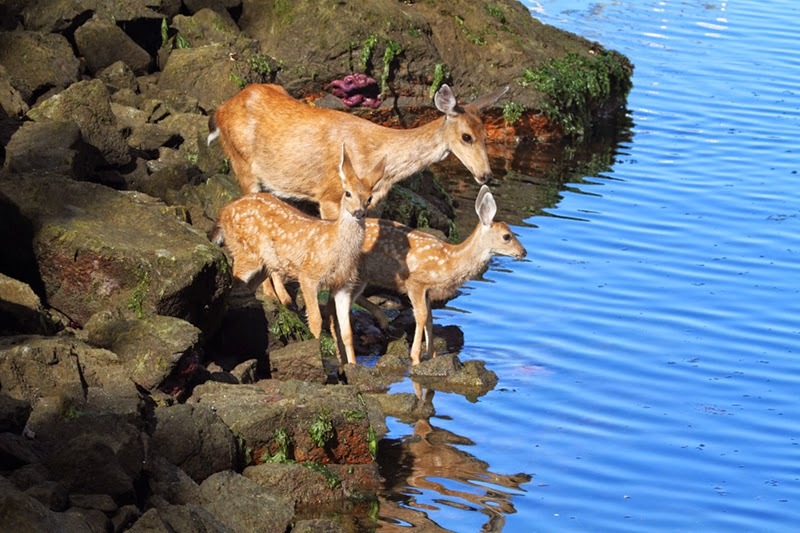 It was a mother deer with her two twin fawns and they were climbing over boulders to get to the ocean. It was one of those magic moments. I froze. 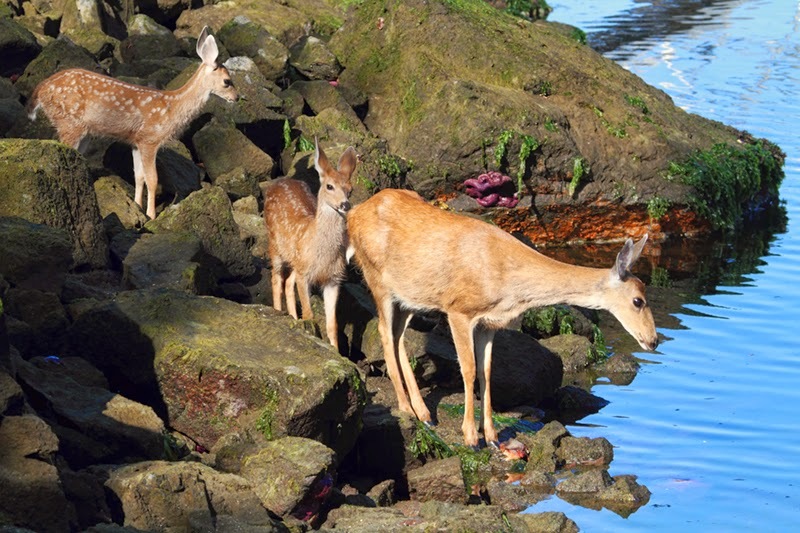 It looked like the mother was either going to go for a swim (I've seen a mother and her fawns swimming there before), or maybe she was going to have a drink of water to get some salt on that hot morning. Unfortunately one of the fawns was startled by a noise from above and she ran off, followed by her sibling. Although they ran right towards me, I dared not move a muscle for fear of scaring them even more. They were about 12 feet away and didn't even seem to notice me. Eventually the family wandered off into the bordering forest, forgetting that moments before they were running in fear. I'd like to be more like those deer. You react when you're in danger and then you forget about it. You live for the moment. You stay in the present time, forget about the past, and don't fret about the future. That's the ideal, anyway. It isn't easy though. I'm constantly bringing myself back to the present moment. I'm trying to savor even the seemingly ordinary moments when nothing "special" is happening. I'm starting to think that even so-called ordinary moments can carry the seed of magic within them. Every moment can be a magic moment. Here's a fascinating TED talk on synthesizing happiness. I recommend checking it out.